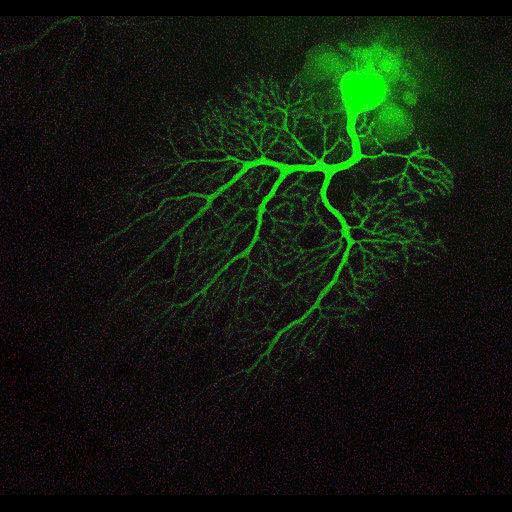 A Purkinje neuron from the cerebellum of a 2 month old male C57BL/6 mouse, injected with Lucifer Yellow. The elaborate, highly branched dendritic arbor is revealed in this maximum projection image which was generated by compiling a z-series of optical sections. This image has been downsampled from the raw data image which can be accessed using the link provided to the Cell Centered Database. Tissue was perfused with paraformaldehyde, sectioned (100 µm) on a vibratome and mounted in gelvatol, and imaged on a Biorad Radiance 2000 Confocal using a 60x 1.4NA objective.